Las Palmas, Gran Canaria, is set amid the impressive views of two secluded bays with glistening sandy beaches. This bustling city is a tourist's delight with high-end boutiques, shopping, and side streets teeming with cafés. Enjoy the buzzing energy of a Mediterranean metropolis and its vibrant nightlife, then retreat to the tranquil shimmering shores of Playa Taurito. Experience the history and culture of this European paradise while enjoying picturesque panoramas of exotic fauna and flora, and the distinguished volcanic landscape of Gran Canaria.Regally perched on the rugged mountainside overlooking the crashing waves of the Atlantic Ocean, Cala Blanca beckons visitors to its charming seaside hideaway. With breathtaking views from tiered balconies, each stylish accommodation features comfortable furnishings and well-equipped kitchens. Relax poolside while sipping a fruity cocktail, or enjoy the resort's sauna, fitness center and tennis facilities. You now have everything you need for the ideal island getaway. Discover relaxation in our 1 bedroom accommodations featuring a comfortable bedroom and well-appointed bathroom with complimentary amenities. The partial kitchen is equipped with a microwave, toaster, dishwasher and coffee maker. Spend time relaxing in the lounge or out on the large terrace. Additional in-room amenities include air conditioning, iron/ironing board and safe. Discover relaxation in our 2 bedroom accommodations featuring a comfortable bedrooms and well-appointed bathroom with complimentary amenities. The partial kitchen is equipped with a microwave, toaster, dishwasher and coffee maker. Spend time relaxing in the lounge or out on the large terrace. Additional in-room amenities include air conditioning, iron/ironing board and safe. Directions to Resort: (From the airport) Follow signs to the GC-1 Sur (South) motorway. Drive for approx 50km until you enter a long (2.5km) tunnel named Túnel de Taurito (not to be confused with the previous tunnel called Túnel de Tauro). Take the first exit to the right (exit 67, Taurito) which will take you in the direction of the coast. At the second roundabout turn left (Lomo Taurito) onto a steep road (you will see a sign with a street named Calle Albaicín), at the end of which you will find Cala Blanca to the right. Driving time: 35 minutes (steady pace). Total distance: 52km. Kennel: Acoran Centro Canino, Barranco Seco, Las Palmas de GC, 928 351 158; 85km from resort. Shops hours are 10:00 to 21:00 Monday to Sunday. Most of the shops mainly located in Puerto de Mogán. Please be advised that, due to three consecutive landslides, the coastal road ( GC 500) to Mogan and Puerto de Mogan has been deemed unsafe and is permanently closed. Guests driving their own cars must take the highway in the opposite direction (to Las Palmas) and make a U-turn at the nearest exit. Our shuttle bus' timetable and destinations is unaffected despite the change in route. We advise our guests that it is prohibited to walk on that road due to the dangers involved. The restaurant and pool-bar at Club Cala Blanca are under new management. With expert restaurateur Greta La Sala at the helm, a menu based on fresh, quality food has been introduced following customers’ feedback gathered in previous years. With the international guest in mind, the contents of this new menu have received splendid reviews. You will notice the attention to detail in every dish, from the home-made hamburger (150 grams -5.29 oz.- of 100% beef) to the delicious desserts created by Greta, a professional patissier. She has brought back two familiar waiters in the ever-cheerful Joel and Juan, guaranteeing the atmosphere for which Club Cala Blanca is famous. You will also meet other members of Greta’s team, like Iacopo who will entertain your children juggling at the slightest provocation, or Kina, a hostess always happy to attend to you and make sure you feel welcome. All in all, an exciting new era in your home away from home in Gran Canaria. Pets are not allowed. As parking is limited, we do not recommend hiring a car. Free Wi-Fi is available at the property. Highlights: Cala Blanca is only 10 minutes away from picturesque Puerto de Mogán, also known as the Canarian Little Venice. 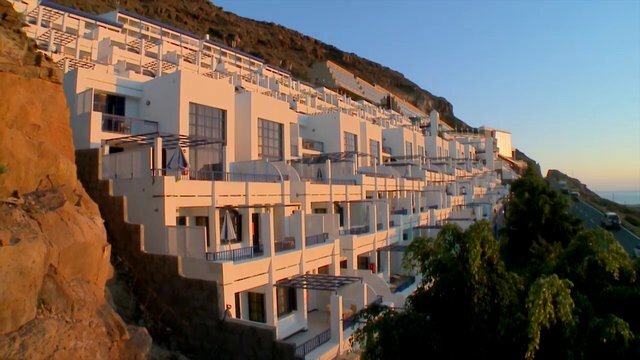 Built on the hillside, every accommodation has a sunny terrace and most of them a clear sea-view. The resort boasts a wonderful pool, restaurant, sauna, gym, whirlpool and tennis court along with home from home comforts in the accommodation choices. The resort is built on a steep mountain side and inevitably presents guests with many steps to negotiate. The public road to the resort is poorly maintained by the Town Council, if at all, and walkways are hostile to wheelchair users. A ramp has been built which provides access to the Reception area. Accessed by 8 steps and a ramp from the outside. Open door. Located in the restaurant area which is only accessed by steps. The swimming pool and the leisure centre are accessed by many steps, ramped access is available. There are 3 disabled parking bays near the resort. One owned by the resort and located next to the ramp leading to the Reception, supplemented by two public spaces right across the street. In all cases, clearly displaying an official Blue Card is required. Please be advised that parking space is very limited in the area and we do not recommend hiring a car as the next space available might be at the bottom of a steep hill. Guests with walking difficulties may find the distances from their parked cars to the resort overwhelming. No accessible accommodation available at the resort. All accommodation accessed by steps, there are 2 lifts at the resort but neither gives full access to each level. Supermarket Hiperdino in Mogan is accessible. Some public buses have ramps for easy access; however, an adapted taxi or minibus can be booked at the resort reception.